As your pregnancy progresses, the excitement and anticipation continues to mount. You likely dream of what your baby will look like and long to hold her in your arms. Throughout this experience, your body has been going through major changes, and you've probably experienced a wide range of symptoms. One thing you may be wondering is when your baby is going to start dropping in your womb and why exactly this happens. Dropping simply means that your baby is starting to move lower down and settle into your abdomen in preparation for a vaginal birth. This process, also referred to as lightening, does not necessarily mean your labor will begin at any certain time, but it can serve as a reminder that labor and delivery are near and that your body is doing exactly what it's supposed to near the end of your pregnancy. Dropping occurs during the last trimester of pregnancy. The precise time this will happen can vary, according to Ask Dr. Sears. If this is your first pregnancy, your baby may drop between two to four weeks prior to delivery. This helps stretch your pelvic muscles in preparation for giving birth for the first time. If this is not your first pregnancy, it may not happen until you start going into labor, since your body has been through this process before and your pelvic muscles are already stretched. When your baby drops further into your womb, it can bring welcome relief from some of the symptoms you may have been experiencing so far during your pregnancy, such as feeling as if you can't breathe. You may experience less frequent heartburn at this point as well, according to Baby Center. Unfortunately, this change can also bring on some new symptoms, including increased pelvic pressure and added pressure on your bladder, causing you to make more frequent trips to the bathroom. Along with the lightening at the end of your pregnancy, you can expect a few other developments. 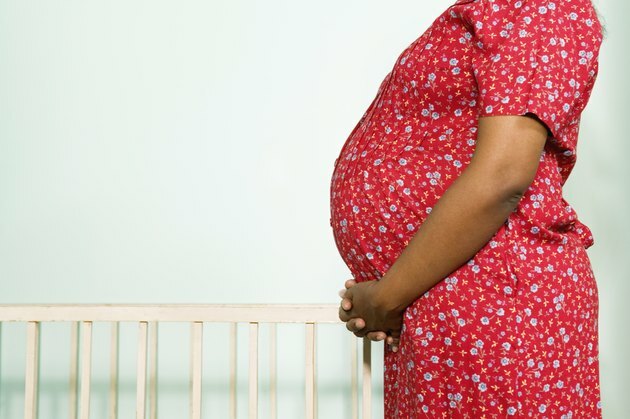 Braxton Hicks contractions may happen more frequently now, according to Baby Center. You may find that your baby is growing quickly and taking up so much room that it's becoming difficult to eat a big meal. Instead, you can opt for more frequent, smaller meals. With your baby dropping lower, you'll also likely start to experience pelvic and lower back aches and pains. During the final weeks of your pregnancy, your doctor will start checking your cervix to see whether it's beginning to dilate or efface, which are common signs that labor is beginning.